I have long been a fan of Kathy York and her Art Quilts. 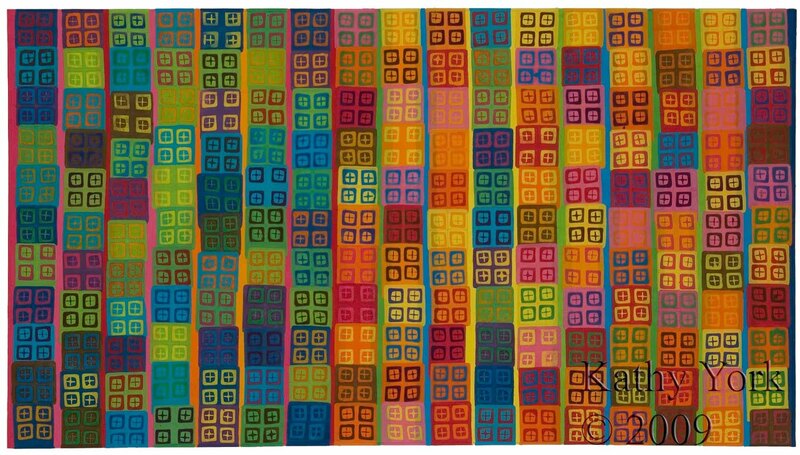 She is immensely talented and I urge you to go and see her quilts in all their glory here …They sing to me .I love this quilt, from 2009, because it is exactly what speech sounds like to me. My synaesthesia has given me a really good ‘ear’ for the rhythm and ‘song’ of English, which is great for teaching international students. If someone’s pron is off, it simply isn’t the right colour for me, which makes it easy to spot and quick to correct. It makes it a joy to teach. You can see more about Kathy’s amazing process in this post here for her urban tree quilt. The colour and detail in each block is just amazing. 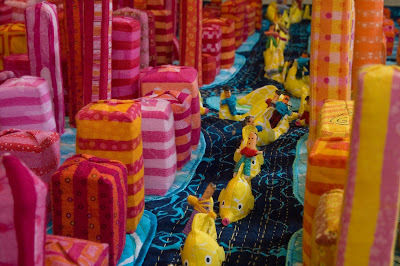 I first crushed on Kathy York over her 3D Art Quilts – especially this Little Fish In A Big City masterpiece. I have always wanted to interview her about her process. Do you have any creative crushes? and happy Friday to you!